In the upcoming Galaxy S8, users will find an extra button on the left side of the phone, just below the volume controls. 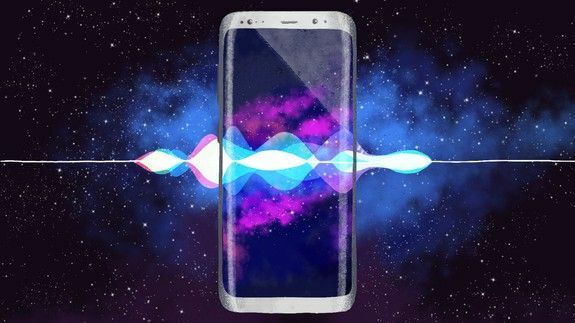 Pressing it will activate Bixby, Samsung's new voice assistant. Once activated, Bixby will help you navigate what's arguably the most sophisticated piece of technology you own — the smartphone in your hand. If Samsung gets its wish, though, Bixby will eventually do much more than just help you order Lyfts or set up complex calendar appointments. The long-term vision is for Bixby to act as a kind of uber-interface for all of Samsung's products: TVs, wearables, washing machines, even remote controls. Samsung designed Bixby with a specific goal in mind, one that veers away from its fellow voice assistants — Apple's Siri, Amazon's Alexa, Microsoft's Cortana and the Google Assistant. Those platforms were generally built to help users quickly perform common tasks ("Remind me to buy milk") and perform search queries ("What's the capital of Brazil?"). Bixby, on the other hand, is all about making the phone itself easier to use, replicating the functions of many apps with voice commands. Yes, Siri et al. already do that to a certain extent — you can easily set a reminder with your voice, for example — but the voice integration typically only handles the basics. The goal of Bixby is to voice-enable every single action in an app that you'd normally do via touch, starting with Samsung's apps. So, not just "set a reminder to buy pickles at 6 p.m., but "Set a reminder on my Shopping List to buy pickles at 6 p.m. and make it repeat every week, then share the list with my wife." Injong Rhee, CTO of Samsung Mobile and the architect behind Bixby, says the voice assistant is nothing short of an "interface revolution," freeing users from hunting down hidden functionality within menus and hard-to-find screens. "Bixby is an intelligent user interface, emphasis... on 'interface,'" Rhee says. "A lot of agents are looking at being knowledgeable, meaning that you can ask questions like, 'Who's president of the U.S.?' A lot of these are glorified extensions of search. What we are doing with Bixby, and what Bixby is capable of doing, is developing a new interface to our devices." Although it makes its debut on the Galaxy S8, it will soon spread. Rhee sees the Bixby button eventually spreading to all kinds of smart-home devices, from TVs to refrigerators to air conditioners. "Anywhere there is an internet connection and a microphone, Bixby can be used," he says. "There is some technology in the device, but a lot of it lives in the cloud. That's why the range of devices goes beyond just a smartphone. It means it can be in any device we produce." Samsung began work on Bixby about 18 months ago, Rhee says. It grew out of the company's S Voice tool, which has been on Samsung phones since 2012. (The timing might explain why Samsung's smart fridge — announced right around then — failed to deliver on its planned integration with Alexa.) S Voice hadn't progressed much over the years, but then last year Samsung acquired the much-hyped Viv Labs and its sophisticated assistant, a strong indicator of the company's renewed interest in voice control. However, Rhee says Viv's technology is planned for future updates to Bixby and doesn't have a role in the initial release.